The movie begins with a young woman being strangled by a man. The man strangling her is accusing her of murder and hiding secrets. He states that if she didn't do it than a ghost did. A series of flashbacks show children running and playing in the forest. Two little girls were playing on a bridge and fall into the water. The woman's demeanor suddenly changes from being frighten to cold and serious. She says, "Then, cry for it." Three men are sitting in the dark, drinking, and asking each other what they would do if they saw a ghost. Two of the men laugh and make fun of the third about his stuttering and cowardice. Stuttering, he says they will be scared too if they meet dead Hyo-jin. The two men stiffen at this, but nervously laugh it off. An awkward silence follow. The third man makes an excuse of having a stomach ache and leaves, complaining about them teasing him. While walking home, he nervously glances at an old bridge and pretends not to see it. He goes to an abandon shack to relieve himself. He sees a woman sitting in a corner, her long hair covering her face. Frighten, he pulls his pants up and attempts to pretend he doesn't see her. The woman turns her face toward him and suddenly appear in front of him. The scene alters to a long hallway. 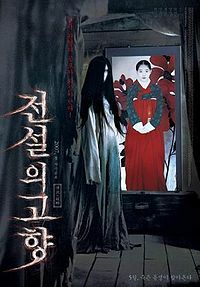 The young woman, So-yeon, shown in the beginning of the film, is shown standing at the end of the hall with a mysterious person behind her. So-yeon opens her eyes. Her mother is beside her and is happy by her waking up. She tells her that she must live for her sister. A doctor is brought to examine So-yeon and informs them that she has lost her memories, distressing the older woman. A man is walking down a trail in the dark. He glances at the bridge and continues to walk into the mist. So-yeon is being pampered and tended to by a servant woman, who tells her that she has been in a coma for ten years. So-yeon does not feel the affects and tells her that she feels as if she just had a good night sleep. Suddenly, she has a vision of drowning and develops chest pains after hearing someone outside speaking about a person drowning in a shallow ditch. The servant woman goes outside to scold the people for gossiping. So-yeon asks him if a man really was found, drowned to death in a ditch. The male servant confirmed this and then wonders how she knew it was a man, since he never stated the gender of the victim. So-yeon runs off, going directly where the body is, arousing the curiosity of her servants. Far in the distance, she sees the body being carried away. It was the stuttering man from earlier. An another woman spots So-yeon and points her out to her brother, the two men who were shown earlier drinking in the dark. While walking away, So-yeon comments that she saw him drowning. Three servants in the kitchen are gossiping about So-yeon's miraculous recover from her coma. They speak about So-yeon's twin sister Hyo-jin. When they were young both girls fell off a bridge and drowned. Hyo-jin drowned to death, while So-yeon was put in a coma. The second daughter, Hyo-jin, was said to be her father's favorite and that their mother always favored the oldest daughter, So-yeon. So-yeon was said to have been a nasty child and often bullied Hyo-jin.